This is something that I have a hard time teaching my children - the difference between taking the fall and jumping for tori. Even adults, though they understand the concept, often have a remnant of this problem. When you are playing the role of uke and being thrown, you should not jump for tori because that is dishonest and dangerous. you are stopping tori from learning what the end of the technique looks like. you are preventing yourself from learning how to save yourself from that particular failure condition. you are forcing tori to exert more of his strength to make the throw go - and that's more energy that you're going to eat when you hit the ground. Or, here's another way of looking at it. 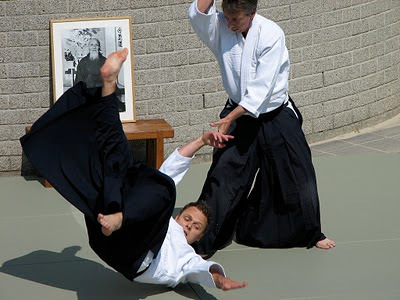 If you do martial arts for long enough, you are going to come across someone who is good enough to force you to take that particular fall by surprise and against your will. When that fateful moment comes, you're going to want to have thousands of repetitions of practice falling from that condition. If you have spent a lot of your time not taking falls then you are definitely going to be sorry. So, take the fall, get up, and practice some more.